Image caption: CADBI organizer Mrs. Dee Dee. Photo by Maddie Rose. For those serving life in prison in Pennsylvania, there is no parole. Ever. As a result, nearly 10% of our prison population is serving life sentences (over 5,000 people). This is why one campaign is choosing to rename “life without parole” for what it really is—Death by Incarceration. 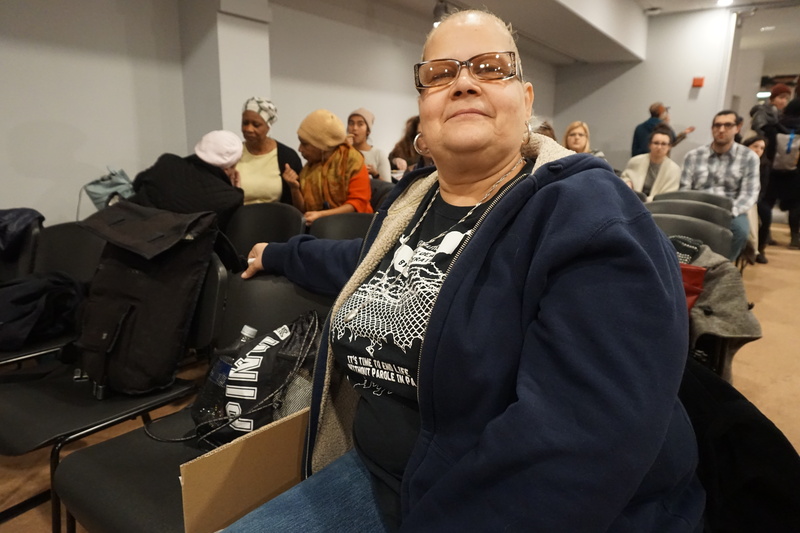 The Coalition to Abolish Death by Incarceration (CADBI) is a campaign fighting to end life without parole, or death by incarceration, sentencings in Pennsylvania. In a recent victory, the Supreme Court ruled that those sentenced to life while young teenagers should now have a chance at parole. Some are starting to come home after decades in prison. But for those handed their Death by Incarceration sentences at the age of 18 or older, the story is much different. Mrs Dee Dee has a unique vantage point to our justice system. She speaks both with confidence and a heavy heart. And fight she does. CADBI is currently backing two bills, one in the PA Senate (SB942) and one in the PA House (HB135). Both allow for presumptive parole eligibility after 15 years for those currently serving Death By Incarceration sentences. Patricia Marshall Vickers, a CADBI organizer, with mementos from her imprisoned son Shakaboona’s youth. Photo by Suzy Subways. However, CADBI is a group that not only is fighting for justice, but simultaneously suffering constant injustice. Key elements of CADBI’s work include community support and relationship building. Members show up at resentencing and parole hearings, and carpool together to visit loved ones on the inside—most recently, they took a multi-hour trip to both Huntington and Smithfield prisons. These trips are also opportunities to organize. A significant portion of CADBI’s membership is on the inside. Visits and paid email interactions allow information to move between members who are connected to politics on the outside and members who report about prison conditions and organizing on the inside. Recently released CADBI organizer Robert Saleem Holbrook, who was sentenced to life without parole when he was 16. Photo by Suzy Subways. Sidebar: An Even Worse Prison? Pennsylvania is still building more prisons — and filling them. The Partisan asked organizer Kerry Shakaboona Marshall how people where he is incarcerated feel about being moved to a newly built prison. The majority of prisoners here at State Correctional Institution (SCI) Graterford have expressed to me and to the SCI Graterford administration major concerns about moving to SCI Phoenix. The majority of prisoners have expressed that they were suffering from anxiety and panic attacks. They have expressed anger at the officials for making them pay to have their personal property shipped to Phoenix or shipped home or forced to destroy it. The elderly prisoners and prisoners with major health problems are expressing anger at being told that they will have to be double-celled with a cellmate now. Prisoners are afraid that the Pennsylvania Department of Corrections isn’t going to allow the variety of programs and the number of inmate organizations at Graterford to be continued at Phoenix. Prisoners are upset about the religious services being severely limited or outright denied. Prisoners believe that the Department of Corrections has no-good intentions of turning Phoenix into a really restrictive, oppressive, and racist institution, as exists at most correctional facilities in the rural parts of Pennsylvania. Prisoners fear a change for the worse at Phoenix. Kerry Shakaboona Marshall is a co-founder of Human Rights Coalition and CADBI. He is editor of The Movement magazine and has been active with the Lifers’ Association at Graterford and other organizations in Pennsylvania prisons, where he has been locked up since 1988, when he was 17. CADBI organizers hope Shakaboona will be coming home to Philadelphia soon, due to recent movement victories. His re-sentencing hearing will be held May 17th. CADBI meets every 3rd Wednesday, 6:30 p.m., Mosaic Community Church at 123 S. 51st Street.